Anti-neutrophil cytoplasmic autoantibody (ANCA)-induced necrotizing crescentic glomerulonephritis (NCGN) requires complement participation in its pathogenesis. We tested the hypothesis that the anaphylatoxin C5a is pivotal to disease induction via the neutrophil C5a receptor (C5aR). Supernatants from ANCA-activated neutrophils activated the complement cascade in normal serum, producing C5a. This conditioned serum primed neutrophils for ANCA-induced respiratory burst; neutrophil C5aR blockade abrogated this priming, but C3aR blockade did not. Furthermore, recombinant C5a but not C3a dosage-dependently primed neutrophils for ANCA-induced respiratory burst. To test the role of C5aR in a model of NCGN, we immunized myeloperoxidase-deficient mice with myeloperoxidase, irradiated them, and transplanted bone marrow from wild-type mice or C5aR-deficient mice into them. All mice that received wild-type marrow (six of six) but only one of eight mice that received C5aR-deficient marrow developed NCGN (P < 0.05). Albuminuria and neutrophil influx into glomeruli were also significantly attenuated in the mice that received C5aR-deficient marrow (P < 0.05). In summary, C5a and the neutrophil C5aR may compose an amplification loop for ANCA-mediated neutrophil activation. 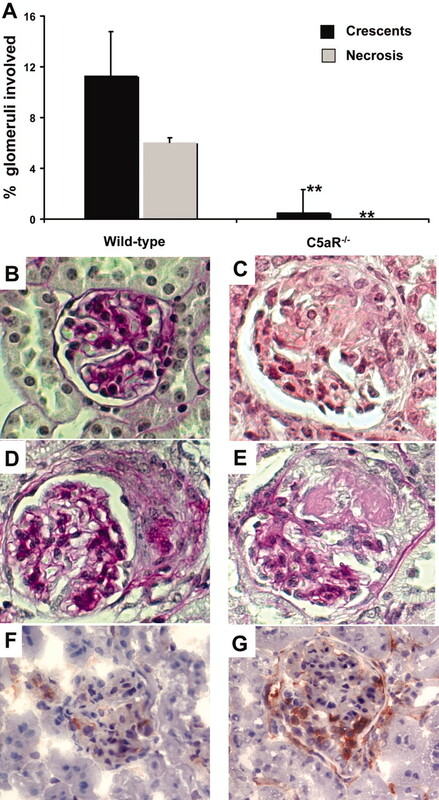 The C5aR may provide a new therapeutic target for ANCA-induced necrotizing crescentic glomerulonephritis. The complement system consists of numerous plasma proteins, membrane-bound and circulating complement regulators, and complement receptors expressed on various cell types. Three different complement activation pathways are known: The classical, the lectin, and the alternative pathway. Independent of the initiating trigger, all three lead to C3 convertase formation that cleaves C3 to C3b and C3a. C3b contributes to the formation of C5 convertase, which cleaves C5 to C5a and C5b. C5b mediates the formation of the C5b-9 terminal membrane attack complex (MAC). The MAC results in lytic and sublytic injury of targeted membrane structures. Independent of MAC effects, the small cleavage products C3a, C4a, and C5a are anaphylatoxins that function as potent inflammatory mediators via specific receptors on both myeloid and nonmyeloid cells. Complement participation in human ANCA disease was not expected, because human ANCA-NCGN shows only a few glomerular C3 and C4 deposits and overt systemic complement consumption with decreased serum C3 and C4 levels do not occur; however, two different animal studies established the importance of the complement system in ANCA disease.10,11 We found recently that the alternative complement pathway is fundamental; mice with factor B or C3 deficiency were completely protected from ANCA-induced NCGN.10 We also observed that factors released from ANCA-activated neutrophils initiated the complement cascade, resulting in the generation of C3a. Because neutrophils express C3a receptor (C3aR) and C5aR, we tested the hypothesis that C3a or C5a is pivotal in ANCA-induced NCGN. Our data establish the importance of C5a and its neutrophil receptor. C5aR blockade may provide a novel therapeutic target. We first studied whether ANCA-stimulated neutrophils cause anaphylatoxin C5a generation in normal human serum. We primed neutrophils with TNF-α and subsequently stimulated them with human MPO-ANCA or PR3-ANCA IgG, resulting in neutrophil activation. We documented activation by estimating the degranulation response, measured as β-glucoronidase release and respiratory burst, measured as superoxide release. Degranulation was 5.7 ± 0.7% in unstimulated cells, 4.9 ± 2.0% in control IgG-treated cells, 15.0 ± 5.4% after treatment with MPO-ANCA, and 27.1 ± 13.0% (n = 4; P < 0.05) with PR3-ANCA. Superoxide production was 2.0 ± 0.6 nmol/106 neutrophils in unstimulated cells, 4.0 ± 0.6 in control IgG-treated cells, 19.0 ± 2.5 after treatment with MPO-ANCA, and 20 ± 3.0 after treatment with PR3-ANCA (n = 4; P < 0.05). We then co-incubated the supernatants for 15 min with an equal volume of normal serum (from here on called conditioned serum). Figure 1 shows C5a generation in the conditioned sera as measured by ELISA. These data show that activation of TNF-α–primed neutrophils with human ANCA preparation resulted in the release of factors into the supernatant that led to C5a generation in normal serum. In contrast, co-incubation of normal serum with buffer control, supernatants of TNF-α–primed neutrophils that were not stimulated with ANCA, or supernatants of TNF-α–primed neutrophils stimulated with healthy IgG, respectively, did not lead to C5a generation. 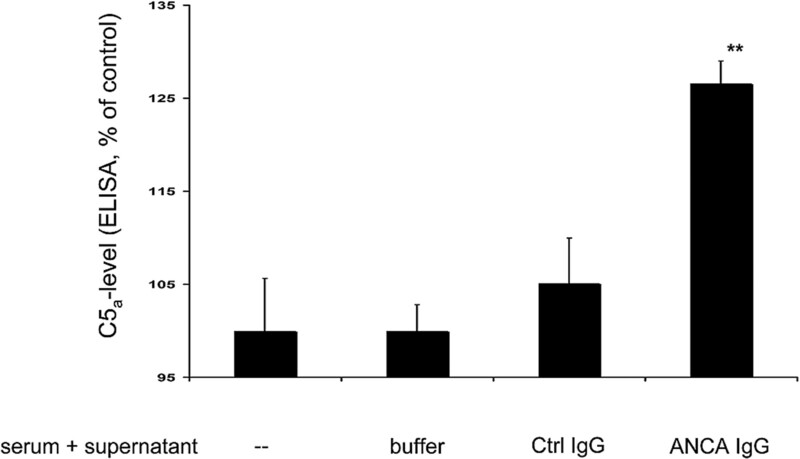 Normal TNF-α–primed neutrophils were stimulated for 45 min with buffer control (buffer), 125 μg/ml normal healthy IgG (Ctrl IgG), or 125 μg/ml ANCA IgG (five independent experiments using MPO-ANCA in two experiments and PR3-ANCA in three experiments). Supernatants from the cell suspensions were incubated for 15 min with normal serum, and C5a generation was measured by a C5a-specific ELISA. Data are means ± SEM (given as ratio to buffer-incubated normal serum [−], which was set at baseline to 100%). **P < 0.01. We showed in our previous study that C3a was also generated in conditioned sera.10 In this study, we tested whether the C3a- and C5a-containing conditioned sera would affect ANCA antigen membrane expression. Increases in membrane-PR3 expression are much stronger during neutrophil priming compared with MPO. We incubated neutrophils with conditioned serum, and membrane-PR3 expression was determined by flow cytometry. Figure 2 shows that neutrophil incubation with conditioned serum obtained by incubating normal serum with supernatant from ANCA-treated neutrophils but not from neutrophils treated with normal IgG resulted in upregulation of membrane-PR3 expression. We repeated the experiments using hirudin-treated plasma instead of serum and recorded similar effects. Membrane-PR3 expression in neutrophils treated with plasma that was co-incubated with supernatants from TNF-α–primed neutrophils stimulated with control IgG was set 100%. When plasma was co-incubated with supernatants from TNF-α–primed neutrophils stimulated with ANCA IgG, membrane-PR3 increased to 154 ± 9.0% (n = 3). These results establish an important biologic effect of conditioned serum with implications for ANCA-induced neutrophil activation. 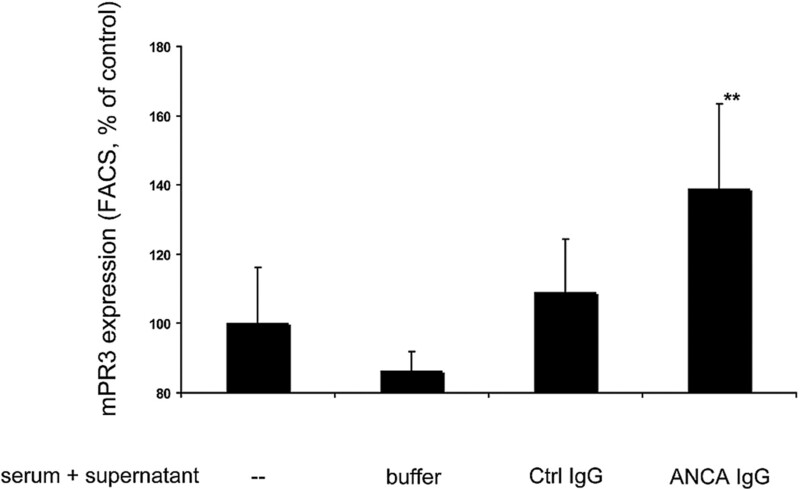 Normal TNF-α–primed neutrophils were stimulated for 45 min with buffer control (buffer), 125 μg/ml normal IgG (Ctrl IgG), or 125 μg/ml ANCA IgG (four independent experiments using MPO-ANCA in two experiments and PR3-ANCA in two experiments). Supernatants of these were incubated for 15 min with normal serum. This conditioned serum was used in different neutrophils for priming, and these cells were analyzed for PR3 membrane expression by FACS. Data are means ± SEM (given as ratio to buffer-incubated normal serum [−], which was set at baseline to 100%). **P < 0.01. We next tested whether conditioned serum primes neutrophils for ANCA-induced respiratory burst. After neutrophil incubation with conditioned serum for 45 min and subsequent stimulation by anti-PR3 IgG for an additional 45 min, we measured reactive oxygen species (ROS) production by the dihydrorhodamine (DHR) assay. Figure 3 indicates that normal serum co-incubated with supernatants from ANCA-stimulated cells was sufficient to prime for ANCA-mediated respiratory burst activity. In contrast, serum treated with supernatants from control IgG-stimulated polymorphonuclear leucocytes did not result in priming. Similar results were obtained when the ferricytochrome C assay was used. Co-incubation of normal serum with supernatants of TNF-α–primed neutrophils activated with a mAb to MPO yielded 171 ± 37%, compared with 124 ± 31% after stimulation with matching isotype control, given as ratio to medium-conditioned serum. These data indicate that C3a- and C5a-conditioned serum primes human neutrophils for subsequent ANCA-induced respiratory burst. Normal TNF-α–primed neutrophils were stimulated as described already. Supernatants from these cells were incubated for 15 min with normal serum. This conditioned serum was used in different neutrophils for priming (45 min at 37°C), after which cells were activated with a mAb to PR3. ROS production was measured after 45 min of stimulation with αPR3, and data are means ± SEM (given as ratio to buffer-incubated normal serum [−], which was set at baseline to 100%). **P < 0.01. We next wanted to establish firmly that the observed priming is indeed mediated by the complement system and not by other factors generated in the serum treated with supernatants from ANCA-stimulated neutrophils. Furthermore, we explored which of the two complement components exercises direct effects on neutrophils via its specific receptor. We first confirmed that neutrophils express both C3aR and C5aR by flow cytometry. A typical flow cytometry analysis is depicted in Figure 4, A and B. In addition to normal serum, we next used C3- and C5-depleted serum to prepare conditioned sera. Figure 4C demonstrates that the presence of either C3 or C5 was essential to generate conditioned serum capable of neutrophil priming for an ANCA-induced respiratory burst. When C3- or C5-depleted serum was used instead of normal serum, the priming capability for subsequent activation of respiratory burst activity in response to a mAb to PR3 was completely abrogated. The priming capability was restored after C5-depleted serum was repleted with human C5 (data not shown); however, C3 is upstream of C5. Conceivably, C3 is needed only for C5a generation as opposed to a direct role in ANCA-induced activation priming. Thus, we used specific receptor blockade for either C3aR or C5aR, respectively, and observed complete abrogation of ANCA-induced respiratory burst activity when a C5aR blocker was present during priming with conditioned serum, as shown in Figure 4D. We confirmed the effect and the specificity of the C5aR-blocking antibody (clone S5/1) by showing complete abrogation of C5a-induced priming for ANCA-induced H2O2 production without inhibition when TNF-α was used for priming. Using the DHR assay and flow cytometry, control IgG-treated cells resulted in 15 ± 0.4 mean fluorescence intensity (MFI) after TNF-α priming and in 12.0 ± 0.4 MFI after C5a priming. These values increased with PR3-ANCA to 180.0 ± 39.0 with TNF-α priming and to 122.0 ± 38.0 with C5a priming. Preincubation with the C5aR-blocking antibody had no effect in PR3-ANCA–stimulated neutrophils primed with TNF-α (167.0 ± 45.0 MFI), whereas the MFI was almost completely abrogated to 23.0 ± 5.0 with C5a priming (n = 3). In contrast, the specific C3aR antagonist SB290157 showed no effect. These data suggest that C3 is necessary for C5a generation; however, it is the C5a that primes neutrophils via the C5aR. (A and B) Normal neutrophils were tested for C3aR and C5aR expression by FACS. A representative example is shown. The gray line depicts the matching isotype control. (C) TNF-α–primed neutrophils were stimulated with a mAb to PR3 for 45 min. Supernatants of these were incubated for 15 min with normal serum (NS), C3-depleted serum, or C5-depleted serum. These different conditioned sera were used in different neutrophils for priming (45 min at 37°C), after which cells were activated with a mAb to PR3. ROS production was measured after 45 min of stimulation with αPR3, and data are means ± SEM (given as MFI; five independent experiments performed in duplicate). (D) Neutrophils were preincubated with a blocking antibody to C5aR or a C3aR blocker, afterward primed with conditioned serum for 45 min and subsequently activated with a mAb to PR3. ROS production was measured after 45 min of stimulation with αPR3, and data are means ± SEM (given as MFI; data from three independent experiments performed in duplicate). **P < 0.01. We next explored mechanisms. We reasoned that a protease- or a ROS-mediated mechanism could be responsible. Thus, we added PMSF or superoxide dismutase (SOD) during the neutrophil stimulation. Furthermore, we heat-inactivated the supernatants for 10 min at 56°C before mixing with serum. 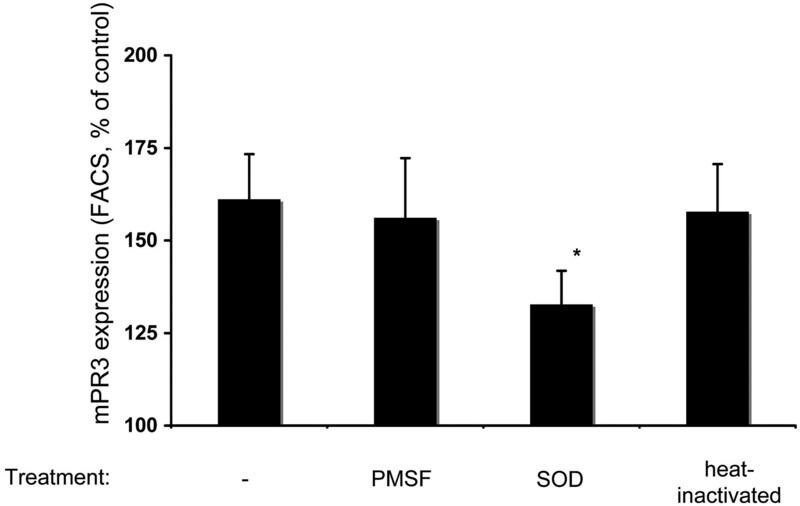 As shown in Figure 5, SOD significantly prevented the priming effect of the supernatant-conditioned serum, whereas PMSF or heat inactivation did not. Thus, our data support the notion that ROS are important mediators of complement activation. Normal TNF-α–primed neutrophils were stimulated as described already. Supernatants from these cells were incubated with normal serum. Before co-incubation, PMSF or SOD was added to the supernatants, or supernatants were heat inactivated. This conditioned serum was used in different neutrophils for priming, before analysis of cells for membrane-PR3 expression by FACS. Data are means ± SEM (given as ratio to buffer-incubated normal serum [−], which was set at baseline to 100%). **P < 0.05. 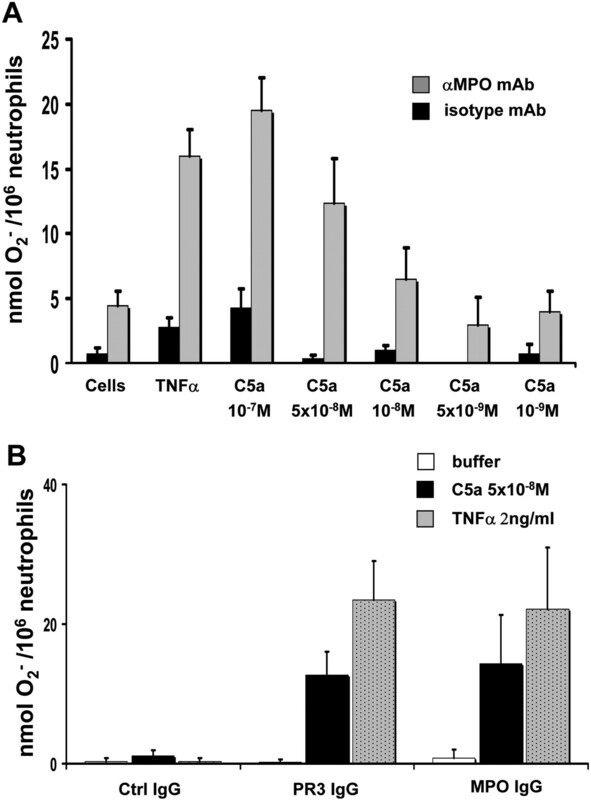 We next studied whether C5a is a sufficient primer for ANCA-induced neutrophil activation. Additional yet not identified serum factors could be needed for the C5a effects. We used recombinant C5a to prime neutrophils for 15 min with increasing concentrations followed by subsequent activation with a mAb to MPO. We quantified superoxide production using the continuous ferricytochrome C assay. Figure 6A shows a dosage-dependent C5a priming effect ranging from 10−7 to 10−9 M. We observed no burst activity with C5a alone, even at the highest concentration. The effect of priming with TNF-α was performed in parallel and is shown for comparison. In the next set of experiments, we used human ANCA preparations instead of mAb to MPO. As shown in Figure 6B, recombinant C5a (5 × 10−8 M) primed neutrophils for respiratory burst activity in response to MPO- and PR3-ANCA IgG preparation, but not for control IgG. Again, TNF-α priming is shown for comparison. , TNF-α–primed cells (data from three independent experiments each using two different PR3-ANCA IgG, two different MPO-ANCA IgG, and two different normal IgG, done in duplicate). Taken together, these in vitro experiments demonstrate that neutrophils release factors after stimulation with ANCA that activate the complement cascade in serum, resulting in the generation of C3a and C5a. This conditioned serum primes neutrophils for subsequent ANCA-induced activation. The observed direct priming effects on neutrophils are caused by C5a, rather than C3a, and are mediated via the neutrophil C5aR. We next studied the role of C5a in ANCA-induced NCGN in an in vivo model. Anti-MPO induced NCGN was induced by the previously described BM transplantation approach.9 MPO-deficient mice were immunized with MPO and irradiated and received BM cells from WT mice or C5aR-gene deficient (C5aR−/−) mice (n = 6 in the WT group, n = 8 in the C5aR−/− group). Eight weeks after transplantation, mice were killed. All mice (100%) that received WT BM cells demonstrated signs of renal disease by developing hematuria and proteinuria. In contrast, mice that received C5aR−/− BM did not develop significant urine abnormalities. These results were confirmed by a significant higher urinary albumin excretion in the mice that received WT BM in comparison with the C5aR−/− BM group: 54.0 ± 13.4 μg/ml in the WT mice compared with 10.0 ± 1.5 μg/ml in the C5aR−/− mice (P < 0.05). All mice that received WT BM developed NCGN on histology (100% disease induction), whereas mice in the C5aR−/− BM group developed only very weak glomerular abnormalities, as shown in Figure 7, A through E. with further details in Table 1. Immunohistology demonstrated a weak accumulation of IgG, IgA, and IgM and complement C3 that did not differ from untreated mice (data not shown). A potential influence of the C5aR phenotype on the anti-MPO IgG level was ruled out because we observed similar titers in both groups as assessed by ELISA (anti-MPO titer after BM transplantation: day 0 WT 2.0 ± 0.6 versus C5aR−/− 2.0 ± 0.2; day 28 WT 1.8 ± 0.6 versus C5aR−/− 1.5 ± 0.4; day 56 WT 1.2 ± 0.8 versus C5aR−/− 1.3 ± 0.3). In addition, both groups of mice demonstrated a similar engraftment with MPO-positive cells. Mice were killed 8 wk after BM transplantation, and renal tissue was examined. (A) The extent of glomerular crescents and necrosis was expressed as the mean percentage of glomeruli with crescents and necrosis. (B) Glomerulus from a C5aR−/− mouse with no lesion. (C through E) WT mice developed glomerular crescents and necrosis. (F and G) Examination for glomerular neutrophil infiltration showed that C5aR−/− mice had fewer glomerular neutrophils (F) than did WT mice (G). **P < 0.01. We observed glomerular neutrophil accumulation in anti-MPO NCGN mice that received WT BM. Because C5aR mediate neutrophil recruitment, we compared neutrophil glomerular accumulation. This was partly abrogated in mice that received C5aR−/− BM, as shown in Figure 7 and detailed in Table 2, indicating that the C5aR expressed on circulating neutrophils plays an important role for the glomerular neutrophil accumulation and for the induction of NCGN. All three complement cascades lead to C3 convertases that generate C3b and C3a by C3 cleavage. Further downstream, C5b and the C5b-9 MAC that mediates complement-induced effects are formed, which are involved in the pathogenesis of renal diseases, such as membranous nephropathy, mesangioproliferative glomerulonephritis, and membranoproliferative glomerulonephritis.12–15 Activation of the complement cascade also yields the small cleavage products C3a and C5a. These anaphylatoxins function as potent inflammatory mediators via specific receptors on both myeloid and nonmyeloid cells. We showed that the generation of the anaphylatoxin C5a by supernatants from ANCA-stimulated neutrophils and C5a-mediated priming effects via its specific receptor allowed neutrophils to generate ROS in response to ANCA. These data suggest a previously unknown role for C5a in ANCA-induced neutrophil activation. We then extended our studies to an animal model of ANCA-induced NCGN. Lack of C5aR on BM-derived circulating cells significantly inhibited neutrophil recruitment and almost completely prevented glomerulonephritis in this neutrophil-dependent mouse model of ANCA-induced disease. Our data outline an amplification loop that may provide a novel therapeutic target in ANCA-associated NCGN. A role for complement in the induction of ANCA-mediated glomerulonephritis was demonstrated in two recent animal studies. Xiao et al.10 proved that the alternative pathways of complement activation are essential for disease induction, whereas Huugen et al.11 showed that anti-MPO NCGN could be prevented by inhibition of complement factor C5. ANCA NCGN in humans is characterized by a paucity of Ig and complement deposits; however, many patients have demonstrable accumulations of complement factors and Ig in glomeruli.16 From the clinical and pathologic characteristics of patients with ANCA vasculitis and NCGN, we reasoned that complement effects mediated by MAC deposition within the glomeruli were less likely to play a significant role in the disease process. We considered an alternative role for complement and studied generation and biologic effects of anaphylatoxins in ANCA-NCGN induction. Anaphylatoxins are involved in a variety of highly inflammatory processes, and neutrophils along with other myeloid cells express C3aR and C5aR. We used sera depleted of C3 or C5, recombinant C3a and C5a, specific C3aR and C5aR blockers to establish the importance for both anaphylatoxins in ANCA-induced neutrophil activation in vitro. Our data indicate that C5a but not C3a upregulates the membrane expression of ANCA antigens and primes neutrophils for a subsequent ANCA-induced respiratory burst. A role for C5aR has been demonstrated in other glomerular diseases.24 C5a is one of the most potent inflammatory peptides with a broad spectrum of actions implicated in many types of inflammation. The molecule shows activities toward many cell types, but the main action seems to be on myeloid cells. For example, C5a is a potent chemoattractant for neutrophils, monocytes, and macrophages.25 In addition, C5a prolongs neutrophil survival by delaying apoptosis,26 enhances expression of adhesion molecules on neutrophils,27 activates respiratory burst and phagocytosis,28 and participates in degranulation.29 All of these functions are important for inflammatory responses and have implications in terms of ANCA-mediated tissue damage. Conceivably, in addition to the upregulation of ANCA antigens and priming for the ANCA-induced respiratory burst shown in our in vitro experiments, some or all of these C5a-related functions participate in ANCA-mediated neutrophil inflammation in vivo. We had an excellent mouse model of ANCA-mediated NCGN available to supplement our in vitro data and tested the significance of the C5aR in this model. This model is particularly suitable for studying neutrophil-dependent functions during disease induction. Previous studies showed that neutrophil depletion completely prevented NCGN in this model.36 In our experiments, we reconstituted the irradiated mice with either WT or C5aR−/− BM from WT. This approach allowed us to study whether the C5aR on myeloid cells was important. Our data demonstrate that the lack of C5aR on myeloid cells significantly reduced urinary abnormalities, neutrophil recruitment, and renal damage. Collectively, our study demonstrates that C5aR expressed on neutrophils is essential in the pathogenesis of ANCA-induced NCGN. We propose that complement activation is initiated by ANCA-induced neutrophil activation and leads to the generation of C5a, which attracts and primes further neutrophils for full activation in response to ANCA. The engagement of the C5a–C5aR pathway is an extremely important event in the pathogenesis of ANCA-induced NCGN. A pharmacologic intervention might provide a novel and less toxic therapeutic strategy. We are currently pursuing these ideas. TNF-α was obtained from R&D Systems (Wiesbaden-Nordenstedt, Germany). Phorbol-2-myristate-13-acetate, DHR, and Ficoll-Hypaque were from Sigma (Deisenhofen, Germany); recombinant C5a was from Biovision (Mountain View, CA); and recombinant C3a and SB290157 were from Calbiochem (Darmstadt, Germany). The blocking antibody to CD88 (C5aR) was clone S5/1 from AbD Serotec (Düsseldorf, Germany).37 Complement-depleted sera were from Merck Biosciences (Darmstadt, Germany). HBSS, PBS, and trypan blue were from Biochrom (Berlin, Germany), and dextran was purchased from GE Healthcare (Amsterdam, Netherlands). The PR3 mAb 4A5 was from Wieslab (Lund, Sweden), and the mAb to MPO was from Acris (Hiddenhausen, Germany); horseradish peroxidase–labeled donkey anti-rabbit IgG was from GE Healthcare. Endotoxin-free reagents and plastic disposables were used in all experiments. We assessed the generation of reactive oxygen radicals using DHR as described previously.39 In brief, neutrophils (1 × 107/ml HBSS) were loaded with DHR (1 μM) for 10 min at 37°C. After 40 min of priming with 2 ng/ml TNF-α or conditioned serum as described in the section titled Activation of Human Neutrophils and Incubation of Serum with Their Supplements, cells were divided and 5 × 105 cells were incubated with the stimuli in a total assay volume of 100 μl. Indicated antibodies were added, and the reactions were stopped after another 30 min by addition of 400 μl of ice-cold PBS/1% BSA. We analyzed samples using a FACScan (Becton Dickinson, Heidelberg, Germany). Data were collected from 10,000 cells per sample. The shift of green fluorescence in the FL-1 mode was determined. For each condition, the MFI (representing the amount of generated hydrogen peroxide) is reported. We measured superoxide using the assay of SOD-inhibitable reduction of ferricytochrome C as described by Pick and Mizel.40 We pretreated neutrophils with 5 μg/ml cytochalasin B for 15 min. Cells (0.75 × 106) were primed with 2 ng/ml TNF-α or conditioned serum for 45 min before human ANCA preparations or mAb to MPO or PR3 were added. The final concentrations were 125 μg/ml for purified IgG preparations and 10 μg/ml for mAb. We conducted experiments in duplicate. Samples were incubated in 96-well plates at 37°C for up to 60 min, and the absorption of samples with and without 300 U/ml SOD was scanned repetitively at 550 nm using a Microplate Autoreader (Molecular Devices, Munich, Germany). The final ferricytochrome C concentration was 50 μmol/L, and the final cell concentration was 3.75 × 106/ml. We used FACS as described previously to evaluate the surface expression on neutrophils.6 The following antibodies were used: MAb to PR3 (CLB 12.8, Amsterdam, Netherlands), MPO (Acris, Hiddenhausen, Germany), CD88 (C5aR, AbD Serotec, Düsseldorf, Germany), C3aR (AbD Serotec, Düsseldorf, Germany), and an appropriate matching isotype control. Flow cytometry was performed using a FACScan (Becton Dickinson, Heidelberg, Germany), and 10,000 events per sample were collected. Neutrophils were treated for 15 min at 4°C with cytochalasin B, primed for 15 min at 37°C with TNF-α, and subsequently activated with human ANCA IgG or control IgG for an additional 15 min. Cells were centrifuged for 7 min at 300 × g, and the supernatants were centrifuged again for 7 min 1000 × g. In supernatants that were not previously stimulated with ANCA IgG, ANCA IgG was added to achieve the same concentration in all samples. Supernatants and normal serum (AB-serum; Sigma-Aldrich) were co-incubated for 45 min at 37°C 1:1 (50 μl/50 μl). In the inhibition studies, 0.5 mM PMSF or 300 U/ml SOD was added during the neutrophil stimulation. For heat inactivation, supernatants were heated for 10 min at 56°C before co-incubation with serum. For the repletion studies, C5-deficient serum was repleted with human C5 (Calbiochem 234405) to a final concentration of 75 μg/ml and with CaCl2 to a final concentration of 20 mmol/L. Nafamostat mesilate (Futhan) was added afterward to prevent further complement activation, and samples were either frozen at −80°C until further testing or instantly used for further experiments. C5a generation was measured by a C5a-specific ELISA (BD Bioscience, Heidelberg, Germany). In brief, normal serum was co-incubated with supernatants from neutrophils activated with human ANCA IgG or control IgG as described already. This conditioned serum was tested for generation of C5a in a C5a-specific ELISA. C5a levels were calculated with a standard curve of different C5a concentrations. C57BL/6J (B6) mouse breeding pairs were purchased from Jackson Laboratories (Bar Harbor, ME). Mice lacking MPO (MPO−/− mice) were the sixth-generation progeny of a backcross into B6 mice originally generated by Aratani et al.41 MPO−/− mice (8 to 10 wk old) were used for immunization. Nine- to 10-wk-old B6 WT mice and C5aR−/− mice (gift from Prof J.E. Gessner, Department of Clinical Immunology, Medical School Hannover, Hannover, Germany) were used as BM donors. Local authorities approved all animal experiments, which followed American Physiologic Society guidelines for animal care. After immunization, the MPO−/− mice were kept in sterile housing conditions with food and water ad libitum (sterile water with trimethoprim and sulfadoxine; Borgal, Intervet, Unterschleissheim, Germany). After immunization, mice were γ-irradiated with 900 rad of whole-body dose and reconstituted with BM cells from WT or C5aR−/− mice of the same genetic background. BM cells were harvested from femurs and tibia, erythrocytes were lysed, and 1.5 × 107 BM cells were intravenously injected. Engraftment was measured by histochemistry for MPO activity on peripheral blood smears. Mice were placed in metabolic cages 1 d before being killed, and urine was collected for 12 h overnight. Urine was tested by dipstick (Roche Diagnostics, Indianapolis, IN) for hematuria, leukocyturia, and proteinuria, and the extent is expressed as the mean on a scale of 0 (none) to 4 (severe). The albuminuria was determined by an albumin-specific ELISA (CellTrend, Lukenwalde, Germany). Results are given as means ± SEM. Comparisons between two groups were done using paired t test. Comparisons between multiple groups were done using one- or two-way ANOVA as indicated. Specific differences between multiple groups were then determined by use of a Bonferroni post hoc test. Differences were considered significant at P < 0.05. A grant from the European Union, EuReGene, and the Deutsche Forschungsgemeinschaft (DFG: SCHR 771/5-1) supported this study. We thank Susanne Rolle, Gisela Philipp, and Baerbel Kuhlmann for excellent technical assistance.